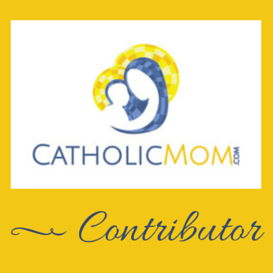 Over the course of the past few days, I've been ruminating on my vocation as a wife and mother. Like fine wine, those relationships have only gotten better with time. :) The commitment and the love was always there, but as time wears on I'm realizing how much my bond with both my husband and kids has matured and deepened. Mike and I married eight and a half years ago. Thinking back on our dating life, it's hard for me to imagine that we forged a relationship toward marriage when we only saw each other a few times per week. We did not live together prior to marriage, we just got to know each other as best we could via old fashioned dates (and without social media, can you imagine? :) Although I decidedly do not envy anybody who has to change their relationship status on Facebook. *shudder*). And I will always remember how I felt on our wedding day. It was so, so special. *Everything* felt different from that point forward, not just the obvious physical relationship. It is my firm belief that it was the grace of the sacrament, which permeated our relationship and has strengthened it day by day. Although I always loved Mike (obviously), I can say without reservation that I love him now *so much more* than when we married. And it's not like our relationship was junky when we were just engaged; it's the graces we received on our wedding day that has made it possible for our love to grow like this. Our marriage, like everyone's, is not perfect. Far from it. But we both value it, cherish it, and work hard at it. It's a blessing, to be sure. "Have you heard anything about the new Superman movie, Sweetie? Lots of people on Twitter are talking about it." "You know the new Superman is Henry Cavil, your boyfriend from when we watched The Tudors." "Who? Wait! OHHHHHHH....that friend of Henry's!" "Ok, with our setup in the guest room for this hot spell (a long story, but due to a circuit breaker problem and us having power sucking window a/c units) I'll sleep on the side closest to the door since I need to get up in the night to use the bathroom." "I don't know Honey, that'll put me on the left side and you know that that is THE WRONG SIDE for me, right?" "Well, otherwise I'll wake you when I get up. Let's try this, I'm sure it'll be fine." "Honey, I'm SO EXCITED for the Catholic New Media Conference! There's a special votive Mass at the beginning, and on Sunday Shauna'h and I may go to Mass at the cathedral in Boston, and at the Tweetup I might get to meet Fr. Roderick and the people from Catholic Weekend, and..."
"I've never met anybody who can ferret out Catholic stuff more than you can. It's very cute." The first thing that drew me to Mike nearly 11 years ago (besides how cute he is) was his ability to make me laugh. His easygoing personality and his infinite patience and support for my passion for my Catholic faith.